Milk Thistle Liver Detox is a commonly searched for term on the internet. It would seem that many people know they are abusing their livers and have heard that Milk Thistle could be the answer to their excessive lifestyle. This article provides basic information about the herb, Milk Thistle--common names, uses, potential side effects, and resources for more information. 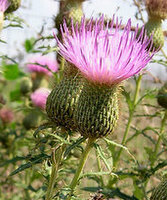 Milk thistle is a plant that is native to the Mediterranean region. It has been used for thousands of years as a remedy for a variety of ailments, especially liver problems. Names--milk thistle, Mary thistle, holy thistle. It is also sometimes called silymarin, which is actually a mixture of the herb's active components, including silybinin (also called silibinin or silybin). Silymarin is the ingredient which can be extracted from the seeds (fruit) and believed to be the biologically active part of the herb. The seeds are used to prepare capsules containing powdered herb or seed; extracts; and infusions (strong teas). There have been a few studies of milk thistle on liver disease in humans. Some promising data has been reported, but study results at this time are mixed. Although some studies conducted outside the United States support claims of oral treatment to improve liver function, there have been flaws in study design and reporting. To date, there is no conclusive evidence to prove its claimed uses. NCCAM is supporting a phase II research study to better understand the use of milk thistle for chronic hepatitis C. With the National Institute of Diabetes and Digestive and Kidney Diseases, NCCAM is planning further studies in the treatment of chronic hepatitis C and nonalcoholic steatohepatitis (liver disease that occurs in people who drink little or no alcohol). The National Cancer Institute and the National Institute of Nursing Research are also studying milk thistle, for cancer prevention and to treat complications in HIV patients. In clinical trials, milk thistle generally has few side effects. Occasionally, people report a laxative effect, upset stomach, diarrhea, and bloating. It can produce allergic reactions, which tend to be more common among people who are allergic to plants in the same family (for example, ragweed, chrysanthemum, marigold, and daisy). It is important to inform your health care providers about any herb or dietary supplement you are using. This helps to ensure safe and coordinated care. Agency for Healthcare Research and Quality. Milk Thistle: Effects on Liver Disease and Cirrhosis and Clinical Adverse Effects. Evidence Report/Technology Assessment no. 21. Rockville, MD: Agency for Healthcare Research and Quality; 2000. 01-E024. Milk thistle (Silybum marianum). In: Coates P, Blackman M, Cragg G, et al., eds. Encyclopedia of Dietary Supplements. New York, NY: Marcel Dekker; 2005:467-482. Accessed at Dekker Encyclopedias Web site on August 22, 2005. Natural Medicines Comprehensive Database. Accessed on August 22, 2005. Milk thistle fruit. In: Blumenthal M, Goldberg A, Brinckman J, eds. Herbal Medicine: Expanded Commission E Monographs. Newton, MA: Lippincott Williams & Wilkins; 2000:257-263. National Center for Complementary and Alternative Medicine. Hepatitis C and Complementary and Alternative Medicine: 2003 Update. National Center for Complementary and Alternative Medicine Web site. Accessed on August 22, 2005. Supplement Safety Article offers important information to consider before you take supplement of any kind.